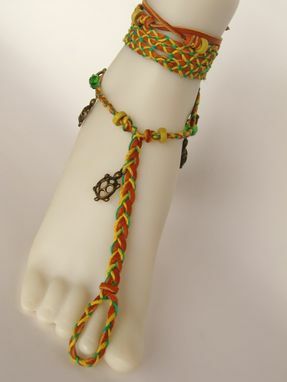 Barefoot Sandals.Tan Deerskin, Turtle Charms, Gold And Green Hemp Cords. Gypsy. Boho. Foot Jewelry. Toe thong. Barefoot sandals. Bohemian. Dancer jewelry. Slave anklets. Artisan jewelry. Tan deerskin hand braided with gold and green color hemp cords. Turtle charms. Gypsy. Rustic. Barefoot sandals are made by weaving together three continuous strands of deerskin and hemp cords. It gives them lasting durability as well as superior comfort. Convo me if you have any questions. Free shipping to US Mainland.